Recently, the demand for an integrated operation and monitoring of distributed controllers across the field is increasing to improve the efficiency of plant operation. To meet this demand, conversion between the CENTUM VP protocol and other control protocols, capability to handle a huge system, and maintainability are required. This paper introduces the Unified Gateway Station (UGS), which can seamlessly connect FCN/FCJ autonomous controllers of STARDOM and third-party controllers to CENTUM VP and achieve a single operation environment for operators. Recently, there is an increasing demand for operation and monitoring of all the various controllers distributed in the field on the same screens to improve plant operation efficiency1. The purpose of the Unified Gateway Station (UGS) is to connect external controllers, such as the STARDOM's FCN/FCJ autonomous controllers and other vendors' controllers, to the CENTUM VP integrated production control system and to operate and monitor those external controllers on the Human Interface Station (HIS) screens, the operation and monitoring screens for the CENTUM VP. To achieve this purpose, the UGS converts various control protocols to the CENTUM VP protocol or vice versa and allows the Human Interface Station (HIS) or the Field Control Station (FCS) to read data from or write data to an external controller via the UGS. In addition, the UGS has a conversion function for alarms, which is essential for operation and monitoring, and thus achieves closer integration. When an external controller is connected to the CENTUM VP, the engineering result of the external controller can be converted and incorporated into the UGS as its engineering data, thus reducing required engineering man-hours. 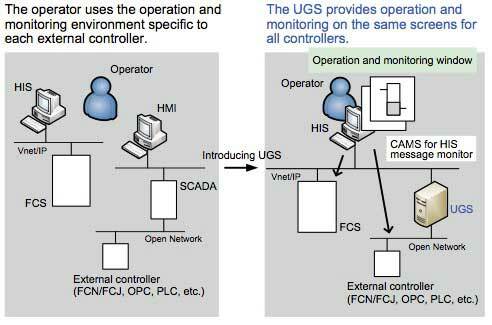 In the upstream of the oil and gas industry such as offshore platforms or subsea wells, which are the target applications of the UGS, as a wide variety of controllers from different vendors are used depending on their specific applications, they are operated and monitored on their own screens. In such an environment, operation and monitoring tasks including those for processes (process data operation and monitoring, and alarm monitoring) and those for the system itself are very inefficient. To solve this problem and improve the efficiency of operation and monitoring tasks, it is necessary to establish a unified operation and monitoring environment that allows the operator to operate and monitor the controllers on the same screens regardless of the differences among the controllers. Conventional solutions to the problem include applying the FCS subsystem communications or the System Integration OPC Station (SIOS) of the CENTUM VP. 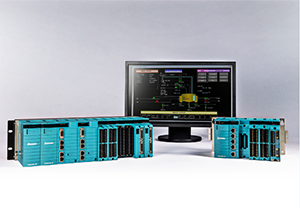 The FCS subsystem communications are highly reliable, but limited in the total capacity of controllers that can be connected to the system. The SIOS requires much engineering effort because it does not support alarms and needs OLE Process Control (OPC) servers to connect external controllers. To solve the problem, we have developed the UGS that has the following features for unified operation and monitoring environment on HIS. The UGS with these features solves the differences among communications protocols, helping the operator smoothly operate and monitor the whole plant. The UGS is a gateway station installed between the CENTUM VP and external controllers to perform communication frame conversion of process data and alarms. Figure 1 shows the UGS's position in a system and its internal configuration. To achieve transparent data access to external controllers, the UGS provides the I/O driver and the function blocks to allow data access from each station. The I/O driver provides the functions of connecting with and acquiring data and alarms from external controllers. The I/O driver periodically acquires data from them and updates the data items in the function blocks. When an upper station updates data items, the I/O driver immediately sends the updated data to the external controllers. The I/O driver supports the following communications protocols. For the FCN/FCJ communications protocol, EtherNet/IP and MODBUS, redundant communication is supported. As for OPC-DA, redundant communication is possible by using the library provided by the OPC server vendor. The function block, a logical collection of data acquired by the I/O driver, generates or forwards alarms. Each station can access data items in the block using tag names, just like accessing the FCS. The UGS supports the following types of function block. Each function block, constituting a logical collection of data, complements operation marks, alarm functions and other functions not supported by external controllers. The function blocks, therefore, provide the same operation and monitoring environment as the existing function blocks of the FCS. As shown in Figure 2, there are different HMI screens for each controller in many existing systems and operators have to use them for operation and monitoring tasks. The UGS enables the whole system to be operated and monitored on the same operation and monitoring screens using the CENTUM VP operation and monitoring window or the message monitor of the Consolidated Alarm Management Software (CAMS for HIS). Individual function blocks have their own names (tag names) just like the function blocks of the FCS. Each station can access a function block in the UGS by using the tag name. Various process alarms generated in the UGS are associated with the tag names of the corresponding function blocks. The I/O driver solves the differences among protocols of external controllers and the function blocks provide the same access method as existing ones. Thus, the UGS achieves a seamless unified operation environment. The function blocks are used for alarm monitoring the same as for data operation and monitoring. Monitoring external controllers is achieved by monitoring alarms generated in the function blocks. 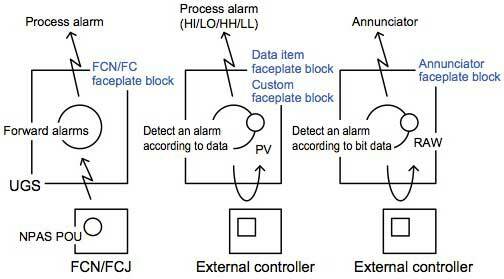 As shown in Figure 3, the function blocks of the UGS convert alarms generated in external controllers (FCN/FCJs) or detect and generate alarms (process alarm or annunciator). The data item faceplate and the annunciator faceplate enable alarm monitoring of external controllers that do not have alarm functions. For all the alarms, settings for acknowledgement (Ack), alarm off (AOF), alarm priority and blinking details (self Ack, lock and non-lock) are available. The UGS can monitor the UGS itself and status of communications with external controllers as part of a unified operation environment. Like other stations, the UGS creates a system alarm in the case of failure or recovery and promptly notifies operators of it. A system alarm generated in FCN/FCJ can be converted to a UGS system alarm format and transmitted. This function enables more elaborate FCN/FCJ monitoring. To monitor the communications status between the UGS and controllers, the UGS provides a communication status using system alarms at disconnection and restoration of the network and the data items of the controller monitor block, which is one of the function blocks. In order to connect many external controllers to the CENTUM VP, the UGS has the following capacity and performance. A single UGS can accommodate up to 100,000 tags (2 million data items) and connect to up to 256 external controllers. The UGS can acquire 6,400 data items per second from external controllers and set 640 data items per second to them. The UGS allows the upper stations to read 6,400 data items per second from and write 640 data items per second to the UGS itself. The UGS provides an efficient engineering environment by importing engineering information for supported external controllers and managing it collectively. Engineering of the UGS is performed using the UGS builder, which is launched from the System View, an engineering function of the CENTUM. 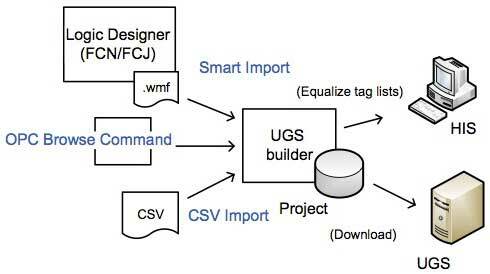 As shown in Figure 4, the GUI-based UGS builder provides engineering functions including import functions. Engineering information defined for the UGS is maintained as part of a project just like other engineering information of a CENTUM VP system. The following import functions enable defined information to be incorporated into the UGS configuration data, and automatic definition of information on connection with external controllers and on function blocks, thus reducing excessive engineering. The following is the engineering procedure using an import function. Execute the import function. Tags are automatically generated. Perform the download. Configuration information is downloaded to HIS and UGS. In the engineering using the import function, definitions of tags are automatically completed in two steps, allowing the HIS to access an external controller. A key requirement in the upstream of the oil and gas industry is the capability to apply online partial changes because wells may be frequently added or deleted. The UGS allows the following items to be changed through online maintenance. 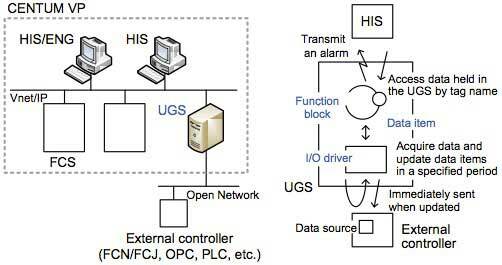 When the configuration of an external controller is modified or devices connected to the controller are replaced, the connection between the UGS and the controller can be switched on/off by the controller monitor block of the UGS to prevent the modification or replacement from affecting the CENTUM. This paper has introduced the UGS developed for a unified operation environment. For this purpose, the function to achieve close integration with external controllers, including data and alarms, was implemented. The UGS has introduced the expandability of the SCADA system to the CENTUM VP highly reliable production control system, offering users highly reliable, optimum solutions. 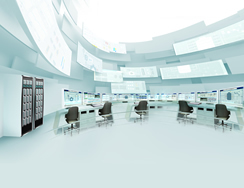 These solutions provide operation and monitoring on the same screens of the HIS, i.e., unified operation and monitoring environment, and the optimum combination of controllers. We will improve the reliability by redundant configuration of the UGS itself, increase the supported communications protocols including those for other vendors' DCS, support broadband and narrowband communications with external controllers and establish cooperation with the Plant Resource Manager (PRM) integrated asset management software package. CENTUM VP, Vnet/IP, SIOS, and PRM are registered trademarks of Yokogawa Electric Corporation. MODBUS and EtherNet/IP are registered trademarks of AEG Schneider and ODVA (Open Device Net Vender Association), respectively. Other product names are trademarks or registered trademarks of respective companies.